You no longer need to travel to Italy for Italian cuisine of pizza or house-made pasta. 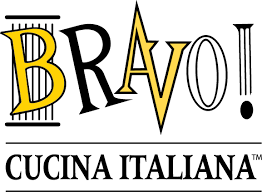 You just need to bring your loved ones and your appetite to our BRAVO Cucina Italiana Italian restaurant at Brookfield. Celebrate with friends and family in a relaxed setting inspired by beautiful Italian Roman décor. Delight your senses and satisfy your palate with our classic Italian menu. It’s an authentic Italian experience you’ll want to remember and repeat again and again … right here in Brookfield, Wisconsin! !